My 3 Monsters: HUGE Holiday Giveaway and Guest Posting at Skip To My Lou today! HUGE Holiday Giveaway and Guest Posting at Skip To My Lou today! Boy, would I love to win the sewing machine! My 40 year old machine is on its last legs and would love to see for my soon to be born granddaughter. My friend has a Baby Lock machine and she sews some beautiful things with it. I love your blog! 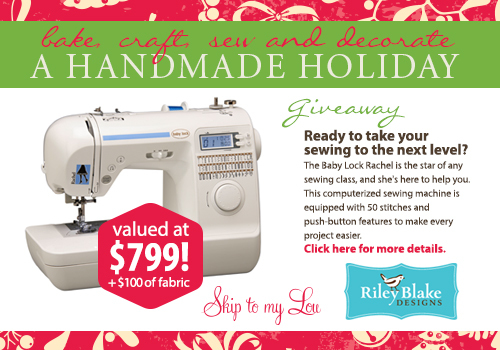 I'd love to win a sewing machine of my own, so don't have to borrow my mom's or mother-in-law's!